Hideo Kojima dined with Square-Enix big shots Yoichi Wada and Tetsuya Nomura and was happy to pass on requests from the Twitter-verse that they remake FF7 already. Though they may make competing games, you'll find that often people who work at - and even run - major studios are friendly on a personal level. While it's doubtful that Bobby Kotick will be invited to John Riccitiello's kids' birthday parties anytime soon, that doesn't mean that people like Konami VIPs like Hideo Kojima and Metal Gear art director Yoji Shinkawa can't chow down with Square-Enix bossmen Yoichi Wada and Final Fantasy mastermind Tetsuya Nomura for a friendly meal. That's not the interesting part to this story, of course. Nor is it interesting that according to Wada, two of the men drank soda while the other two had alcohol (I bet it was Nomura and Kojima with the booze). What is interesting is that after Kojima mentioned his dinner meeting on his Twitter account, one of his hundred-thousand followers requested that he tell Wada and Nomura to stop putzing around and remake FF7 already. "I passed it along," answered Kojima. Other messages that Kojima says he passed on to the Square-Enix big shots include "Hurry up and release Kingdom Hearts 3D," and "Tell Wada I'm waiting for Seiken Densetsu (Secret of Mana) 5." However, he did not tell Wada and Nomura that one of his Twitter followers wanted to tell them "I'm looking forward to the new Zelda game," and for good reason. 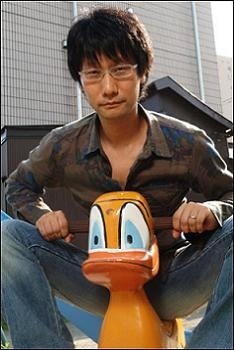 Kojima also told Nomura to get a Twitter account of his very own. Unfortunately, @beltsandzippers is already taken ... by a parody Tetsuya Nomura account. Square-Enix has in the past discussed the many difficulties of remaking FF7, and funny though it might be I doubt that a single recommendation from Hideo Kojima will convince them either way. That said, now I'm wondering what a FF7 remake would look like if Kojima had a hand in making it. It's kind of a disturbing mental image.